The Palace of Westminster risks "crisis" and a growing risk of a "catastrophic event" without a £4bn restoration, MPs and peers have warned. All MPs and peers should vacate both Houses of Parliament for six years for urgent repairs, a senior parliamentary committee has recommended. It wants the Department of Health's headquarters to host MPs, with Lords moving to the QEII conference centre. Both Houses of Parliament are expected to need to approve the temporary move. The Joint Committee on the Palace of Westminster warned the decision on how to repair Parliament must not delay further and suggest work, estimated to take about six years, should start in 2023. A delivery authority to prepare the budget should be formed, the report said. Then a detailed preparatory stage must take place to make sure plans were cost-effective. Parts of the Palace of Westminster are so riddled with asbestos, frail stonework and ageing electrics and wiring, it has been said the Grade I-listed building would be knocked down if it was not protected. "The Palace of Westminster, a masterpiece of Victorian and medieval architecture and engineering, faces an impending crisis which we cannot responsibly ignore," the report said. "It is impossible to say when this will happen, but there is a substantial and growing risk of either a single, catastrophic event, such as a major fire, or a succession of incremental failures in essential systems which would lead to Parliament no longer being able to occupy the Palace." Lord Lisvane, formerly the most senior Commons official, added: "The roofs are leaking. The stonework is rotting. We need to do a great deal more in fire compartmentation." He added: "All of the facilities, whether it's electricity, IT, comms, sewage, fresh water, high pressure steam, central heating, all of that, have just been laid one over the other. "I don't think I'm giving away any secrets by saying there are lots of wires, nobody is quite sure where they go." The work to repair Westminster could be hampered by a shortage of trained craftsmen and women, the Royal Institute of British Architects (Riba) warns. The committee behind the plans for the palace wants MPs to move out to enable the work to be be carried out as quickly as possible. But Riba doubts that is possible with current specialist skills levels. It blames a decline in investment in conservation and a high existing demand for workers. But it admits the parliament project may be the ideal opportunity for training the "next generation". It is 60 years since Parliament's last major refurbishment and some of the restoration committee's members were sceptical about the need for a total relocation at first, rather than having the repairs in stages to allow members to remain in situ. The BBC Daily Politics' Mark Lobel said a source close to the committee said that after more than a year touring the crumbling parts and interviewing experts the weight of evidence convinced them of the urgent need for action. 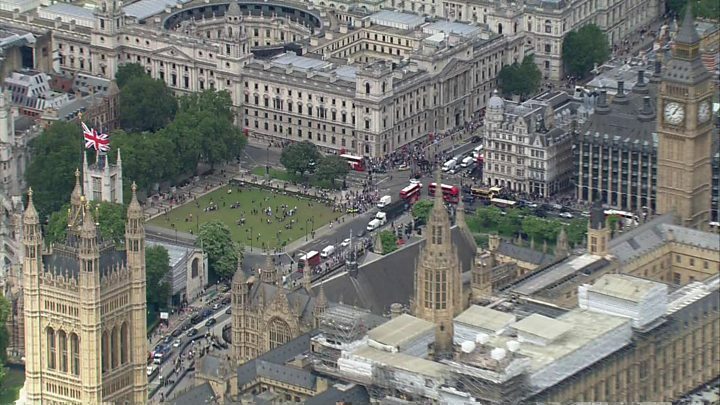 The plan would be for MPs to relocate to the Department of Health's nearby headquarters on Whitehall, building a temporary debating chamber in the courtyard in which MPs would debate laws, vote, deliver statements and hold Prime Minister's Questions. It is seen as a safe location on the parliamentary estate and many MPs have offices in neighbouring buildings, Mark Lobel added. Under the committee's plans, the House of Lords would be relocated to the QEII conference centre, which has a wide variety of conference rooms, just across Parliament Square. As it is owned by the government, the centre could quite easily be turned into a second chamber to shape laws and challenge the executive. Where would state occasions be held? Key ceremonies like the State Opening of Parliament and the lying-in-state period after a death of a member of the Royal Family would have to be moved from the Palace of Westminster if and when the relocation and renovation programme proceeds. Buckingham Palace, Banqueting House on Whitehall, - the last surviving part of the Palace of Whitehall - Westminster School and Westminster Abbey are among the locations being mooted by the joint committee. It is confident "suitably dignified" alternative arrangements could be made. The Royal Household has responsibility for reviewing plans for any lying-in-state. It would not be the first time a state opening happened outside of the Houses of Parliament - alternative arrangements had to be made after a fire in the 1830s. Addresses by foreign heads of state and minor, daily ceremonies such as processions by the speakers of the House of Commons and the Lords would also have to be considered. Downing Street said the Prime Minister would consider and respond to the report, but did not set out a timescale. Theresa May would be determined to ensure value for money for the taxpayer on the multi-billion pound project, a spokesman added. He added: "We are talking about protecting one of our most treasured buildings, an internationally recognised landmark. It's right that we protect a building which has such important historic value."